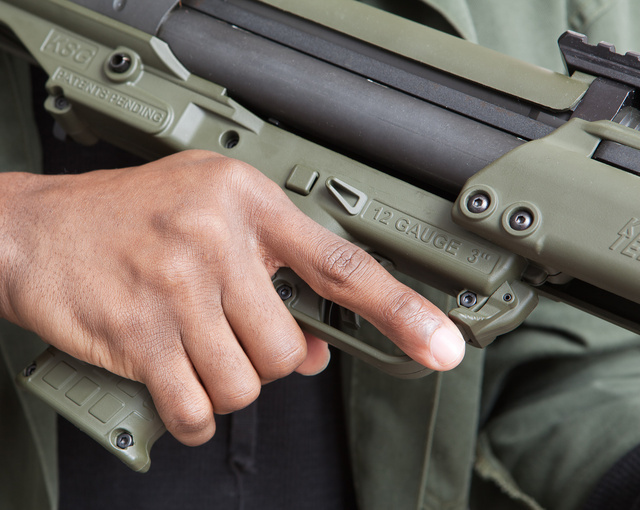 Production KSG runs 3″ shells, so its capacity is nominally 12+1. With 2.75″ shells it holds 14+1. This one has a muzzle set up for chokes, brakes, breaching stand-off devices. The light “dashes” on top of the magazine tube are witness holes for keeping track of the ammo supply. This entry was posted in shotgun, weapon and tagged 12ga, bullpup, green, keltec, KSG. Bookmark the permalink. Love the firearm and the clear photographs Oleg! That critter may be the only thing I ever buy using my FFL. Might have to buy 2 just for the giggles. what are the chances we’ll see green models in stores? black i expect… haven’t seen any non-black in a store yet for anything. A lot of times colored polymer seems gimmicky to me, but this is a definite exception. This KSG looks 10 times more compelling than all black. Gorgeous. Please let me know where you got your muzzle break from!